Listen to Chuck Swindoll’s overview of Luke in his audio message from the Classic series God’s Masterwork. Luke’s own introduction to his gospel indicates that Luke composed the letter with the purpose of providing a careful rendering of the events of Christ’s life in chronological order. As a physician, Luke would have been trained as a careful observer, a quality that would have been invaluable in this project. The result was the first part of a two-volume work written to Theophilus. We know the subsequent volume as Acts. Much of the dating of the book of Luke depends on the dating of Acts. Luke’s second volume cuts off with Paul imprisoned in Rome, before Paul’s death (AD 68) and even before the persecution of Christians broke out under Nero (AD 64). It stands to reason that the book of Luke was completed before Acts. But when? Acts 21:17 says that Luke accompanied Paul on the apostle’s final visit to Jerusalem, a visit that occurred in AD 57–58. Eventually, the Jews had Paul arrested in the temple, a two-year ordeal which ended with Paul’s imprisonment in Caesarea. 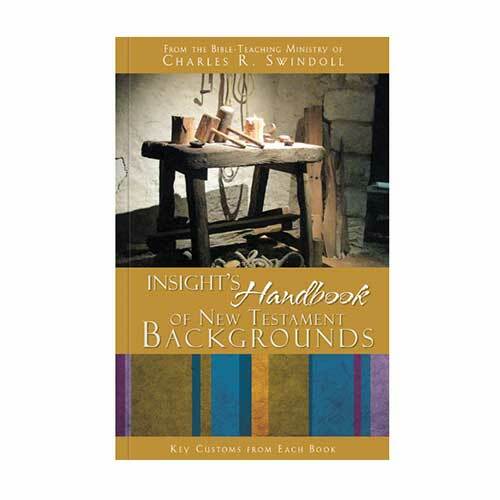 Luke likely used this time apart from Paul to begin gathering information for writing the gospel from primary sources—those people who had witnessed the ministry, death, and resurrection appearances of Jesus. If Luke took to writing his gospel soon after the information was gathered, then it would have been completed around AD 60, after Paul had been transferred to a Roman prison. Luke’s interest in people is undeniable. Much of the material unique to Luke’s gospel involves Jesus’s interactions with individuals, many of them on the fringes of “acceptable” society—sinners, women, and children among them. Like Matthew and Mark, Luke recorded the incident of a woman coming to pour perfume on Jesus’s feet. But Luke was the only gospel writer to point out the fact known to all present that she was an immoral woman (Luke 7:37). In a similar way, we find in Luke alone the conversation between the robbers crucified alongside Jesus, one of them defending Jesus and receiving the promise of paradise. Luke’s portrayal of Jesus reveals in our Lord a man come to minister and show compassion to all people, no matter their station in life. Just as Matthew portrays Jesus as the King, and as Mark reveals Him as the Servant, so Luke offers a unique perspective of Jesus as the Son of Man. This phrase, “Son of Man,” was Jesus’s favorite way to refer to Himself. Most famous among the people unique to Luke’s gospel is the tax collector Zaccheus, a short man who had to climb a tree to see over the crowds as Jesus approached his town. Jesus ended up sharing a meal with Zaccheus at his house, much to the chagrin of the local religious leaders. When Zaccheus expressed his regret over his former way of life and vowed to make restitution, Jesus responded with what became the theme of Luke’s gospel: “For the Son of Man has come to seek and to save that which was lost” (Luke 19:10). Luke portrayed Jesus as God’s ideal Man, who offers salvation to all humanity—Jew and Gentile alike. The richness of Luke’s portrayal of Jesus has profound implications for our relationship with God today. Jesus walks through Luke’s gospel illustrating His deep and abiding care for people, regardless of what they have done or their status in society. Do you believe that God loves you no matter what you’ve done? The fact that the eternal Son of God condescended to lower Himself, take on human flesh, make Himself subject to human limitations, and seek out His people in bodily form shows us clearly how much God cares for us and, in turn, how we are to care for others. 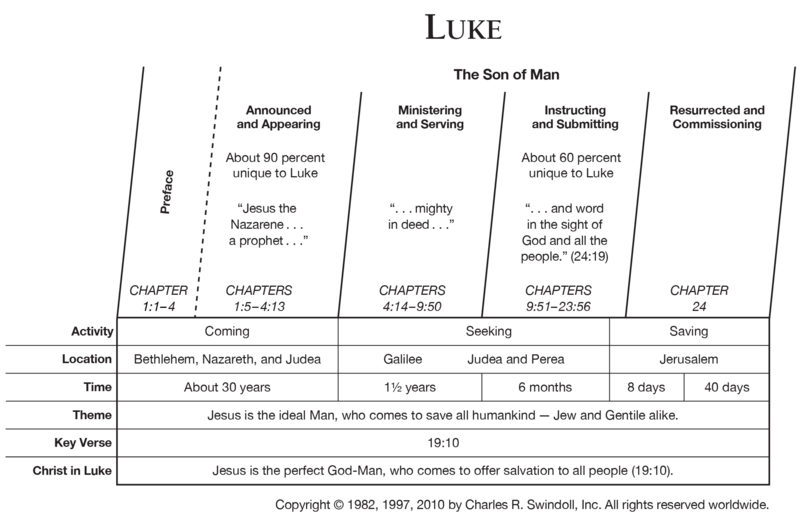 View Chuck Swindoll's chart of Luke, which divides the book into major sections and highlights themes and key verses. 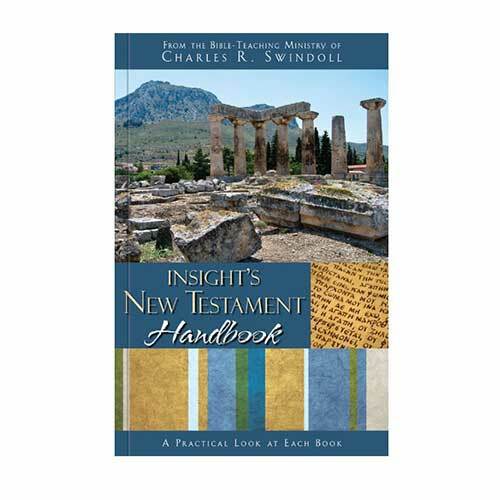 Discover more resources related to Luke.